Read this on medium.com via ideas.riverglide.com. After some time, your vitamin C deficiency still hasn’t improved. So everyone says “down with oranges, they don’t work”—including the some of the authors who’s articles you’d read. The problem was that you were eating apples, not oranges. But it’s too late, you, your colleagues, some authors of the articles you read—now have a disdain for anything labelled ‘oranges’. Truly understand the User Story paradigm and you realise that the Connextra template is as useful as ever. Think of a User Story as a short-story that a user will be able to tell about what they want to do and why they want to do it. It’s not the feature the product will have or the actions they’ll perform, it’s what the user will be able to do – as in achieve. One story may actually mean subtle or significant changes to multiple features, involving several actions. User stories are a paradigm shift, a different way of working. Jeff Patton explains this superbly in slides 1-50 of his User Story Mapping slides (I highly recommend you flip through them). Jeff highlights that “Stories aren’t a different way to write requirements, they’re a different way to work”. The misunderstanding that User Stories are just a different way to write old-style software requirements has contributed to continuous deterioration in how the Connextra template is communicated across the industry—changing User Stories into product features (or user action within a feature). Product features and actions within them generally describe the product (not the problem)… again, like old-school requirements. Unfortunately, the problem wasn’t with the Connextra template, it was with widespread misinterpretation of it. This misinterpretation propagated so far and wide, that many teams now experience the problems caused by slicing work into product features (problems that User Stories are designed to solve). And now people are saying—“User Stories are broken!” and “the Connextra Story Template doesn’t work”. Clearly, comparing apples and oranges, much like in the opening story. This helps us start the right conversation; exploring the short story a user could tell about something they’ll be able to do – hence the term ‘User Story’. The “As a…” helps us start empathising with the user. The “I want to…” gets us thinking about what they want to do (not how). The “So that…” get us closer to their motivation – why they’d want to do this. Whether it was the intent or not, I believe that these variations made it easier for teams to think they were working with User Stories when in fact they were simply capturing product-features and business-benefits like old-style software “requirements” – only dressed in a User Story like template. User stories are about the user – hence the name. It’s a way of working, not a way of writing requirements. This is an area we all need to get better at explaining. What we write on the User Story card (or electronic equivalent) using the original Connextra template helps us start the right conversation about users’ needs, slicing by value to the user. Starting the right conversation to slice by business value is a different problem. The original Connextra template works just fine for User Stories that tell a story about the user. The template wasn’t trying to fix the mindset of slicing-by-feature. Books like User Stories Applied were there for that. The misconceptions began when people assimilated User Stories through their feature-biased filters and tried to ‘fix’ it – rather than question their own understanding. This left many teams with “features dressed as stories” caused by a fundamental, yet common, misunderstanding. Who knows, I may have once shared in that misunderstanding myself. Now, we have an opportunity to change this by learning more truths about User Stories so that we can all benefit from increased agility. Have you been working with features dressed as stories? If so, and you want that to change, here’s a place to start. 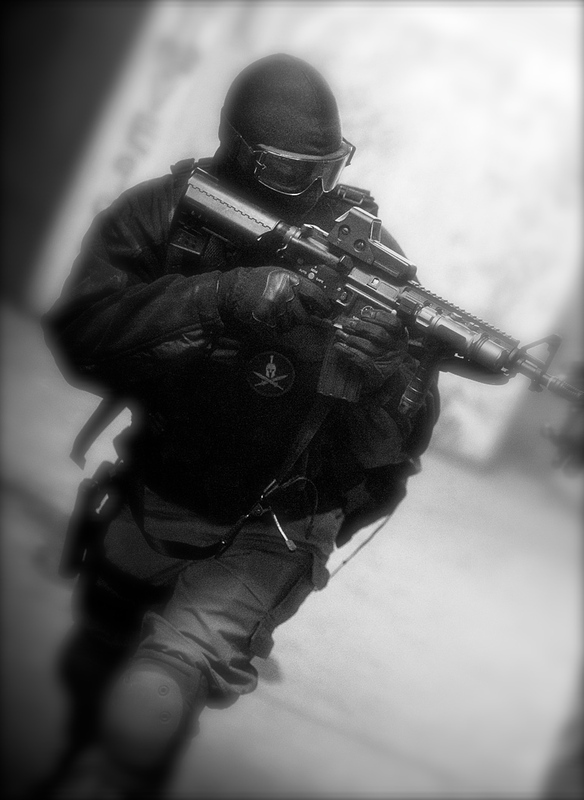 So that I can choose to respond while topics are current. So that I can find out as soon as others interact with me. The problem here is thinking of user stories in terms of what the user will have, rather than what they’ll be able to do. This can cause avoidable dependencies that limit your flexibility, reduce your speed to market and limit your ability to change direction based on market feedback. so that I can prepare food. so that I can sleep comfortably with my partner. so that I can park my car off the street. Have a think about what’s involved in delivering these stories with a lego house, building our final vision of the kitchen, the bedroom, the garage. If our vision is to have the master bedroom on the top floor, then we can’t have a place to sleep until we’ve built the ground floor. To build our garage ‘iteratively’ we will focus on building the walls first, then put the roof on. Essentially, the architecture drives the order of implementation, not what is of greatest value to us. The problem here is that these stories are encouraging us to fixate on specific solutions to each problem. Ideally, we want the story to be about what the user will be able to do (i.e. sleep comfortably together), not what they’ll have (a bedroom). so that we can safely enjoy various fresh foods. so that we can keep each other warm. so that I can keep my insurance premiums low. Have a think about the different ways we could initially solve these problems (from camping cookers, a mattress on the floor and a driveway to park the car). We can meet all of these needs rapidly without having to achieve the final vision but make it possible to layer on more and more refinement to each one evolving to the solution and enabling us to discover the solution we really need. when what we want is “a thing” then what we are describing is not a user story – it is a feature. Relatively recently, while running my user stories course (with Lego) to delegates at a well known company, one delegate pointed out a difference between the ‘template’ for the two story styles above. They observed that in the case of stories that are really “Features” the format tended to be “I want a…” whereas for stories that were “Capabilities” the format tended to be “I want to…”. Some found ways around this by saying “I want to have a…”. Interestingly, the original ‘Conextra Template‘ indeed followed “I want to…” and all of Mike Cohn’s examples in his book “User Stories Applied” are indeed capabilities (although sometimes in his explanations he does refer to stories as describing a feature, his examples are generally capabilities). In short, when what we want is “a thing” then what we are describing is not a user story – it is a feature. so that I don’t have to wash it as often. so that opportunists don’t think of stealing or vandalising it. so that I get the lowest insurance premiums. so that it’s easier to do basic maintenance. Now think of the different ways we could meet those needs with our lego house? Most of these stories are largely independent of each other and can be delivered in almost any order. This allows us to prioritise the stories based on value rather than the architecture of the final vision. We’ll realise our first piece of value very quickly and continuously gain more and more value until eventually we’ll have a whole garage (if that’s what we really need). If this was something that makes us money, it would mean we’d be generating revenue sooner. Revenue would grow continuously as we continuously grow our product. It also means we can change direction at any time, for example if we were to start getting feedback taking the garage more in the direction of a workshop with space for a car rather than just a simple garage. I recently helped a client interview people who had from three to five years “experience” with user stories. During the interview I pulled out some index cards and pens. I described a simple product (which was surprisingly similar to early incarnations of Twitter) and invited them to help us write some user stories for our backlog. I asked them to help us prioritise them based on value. “Registration is most valuable because without it we can’t do anything else”–one interviewee explained. This means that it would not be possible to obtain any feedback about the main value proposition of the product until a number of user stories are complete. Each candidate explained the stories as dependent steps in a journey that, essentially, had to be built in the same sequence as the journey . The main value proposition is sharing updates with people and seeing what others are saying. A simple screen-name (like in a chat room) will do initially. Registration and login are largely about hindering others from pretending to be me. Could there be simpler ways of achieving this at first? Like I said, I’m not suggesting that any of the story titles that each candidate came up with are invalid, just that they thought of them in terms of the expected solution (what the user will have), not understanding the real problem (what valuable thing the user will be able to do). With tractable mediums like lego or code (with the right engineering practices around it), we are able to evolve our product to meet each user-need in turn. This is facilitated by thinking of our user stories in terms of the outcome (e.g. shelter from the rain) rather than one possible output (e.g. a roof and four pillars). Ultimately, this way of thinking is one of the key upstream enablers to realising value early & often and brings more opportunity to rapidly adapt to feedback by dramatically reducing dependencies. Experience this for yourself: If you would like me to run this as a hands-on workshop with your team(s), let me know. We’ll explore how user stories work in practice, not only by writing the stories, but understanding the conversation and means of confirmation  that complete the practice of user-stories. I can also wrap this in a simulation of Scrum and/or Kanban so that teams can experience how user stories work in practice. I make it accessible to all team members using lego as a metaphor for software, demonstrating the principles described above. We then explore how to apply this to your products, writing some stories or reviewing and refining your existing stories to take what we learn into the real world. 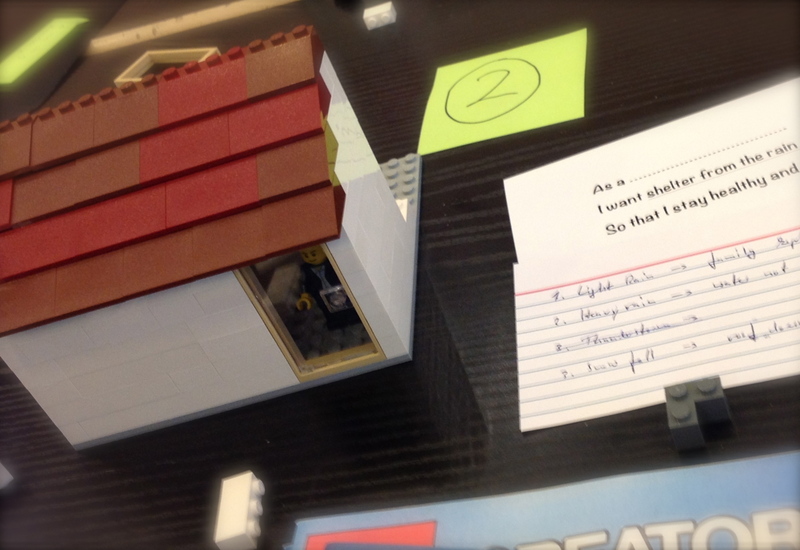 The Lego House exercise that I run has been created by combining my experience with a number of other exercises, including the “XP Lego Game” and Rachel Davies‘ Household Stories exercise. “Building software” is a phrase I hear used time and again. Indeed, many do still think of software development as akin to construction. Modern (agile) software development doesn’t feel like that to me. There was a time, like the construction architect, when we had to increment and iterate on paper and in models. The cost of computing was too high to do such iteration inside the machine. The cost difference between making a small change in our understanding and reflecting that in the actual product was too great. The cost of change meant that we had to treat the creation of software like constructing buildings or bridges. But those times are, or should be, in the past. 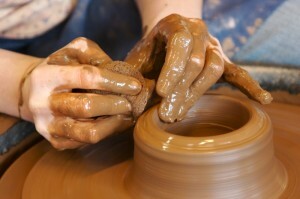 To me, modern (agile) software development feels more like pottery. But, instead of ‘throwing clay’ we throw our consciousness, in the form of electrons flowing over silicon, onto a spinning wheel of user-story implementation cycles. We evolve our understanding of what our customer wants with each conversation. We reflect that understanding by evolving the product’s shape as we touch the outer surface with each new automated acceptance test (or example scenario). We evolve its structure as we touch the inner surface with each new unit test (or unit specification). We keep it supple as we moisten it with each refactoring. Our customer looks on, gives us feedback and we start the next revolution of the software development wheel. Never letting the product dry and harden; keeping it flexible, malleable, soft(ware). There is nothing that feels like construction here. I never feel like I’m “building” something. Much more like I’m evolving my understanding, evolving the product, evolving my understanding again and so on. For these reasons l am not comfortable with referring to this process as “building”. I’m also not comfortable calling it “throwing” (as in pottery). From the first thought of a new idea, through each conversation along the way, to each revolution of the software development wheel, I develop products. I create. I make. I shape. I evolve. Footnote: I’m not aware of anyone drawing this analogy before. If you have heard or read someone explain it in this way before now, please let me know. Basically, it helps us to evolve everyone’s understanding of the business-need as we (by other means) also evolve the implementation of the product. Now, before you say, “it’s nothing new”, Chris Matts will be the first to agree. He’s taken his experience of various techniques, combined several of them that often work, evolved it into an approach to agile business analysis and given it a name. I wish I could explain all of this now, but we’ll have to save that for another day. This post is intended to try to explain the relationship between Feature Injection and User Stories. I’ve seen several examples of user stories taking some inspiration from Feature Injection, however, I’m not sure any of them do Feature Injection enough justice. The intent behind this shuffling around is to get people to think about the problem in order of business value first, then the stakeholder then what the stakeholder thinks will deliver the value. But, the story is talking about a stakeholder… In my experience, this doesn’t get the best value from the user story approach. Stakeholder ‘stories’ or User Stories? I’ve found that user stories are most useful when communicating to the team if they encourage a conversation around who the user is, what capability the user needs and why it’s important to the user (could that be why they are called “user stories”?). This helps us to understand what user experience they need and what capability will make that possible. If we discuss this solely from the business stakeholder’s point of view, the team doesn’t get as much understanding from what is needed by the user or why the user will need this capability. If the capability summarises what the product will enable or do for user it’s a lot easier to see what needs to be changed in the product. The benefit should be the answer to “what’s in it for the user?” or “why would they want the product to do that?” (exploring the persona of the user is helpful in finding this out). Ah… but now we’re back where we started – where’s the business value? How do we get people to think about the business value first and then identify the roles and capabilities? Ideally, we want the benefit of driving the features from the business value and the increased understanding of what we’re implementing by understanding the user in our conversations around a user story. To get to the right place, we need to start again with our example. Imagine that, instead of the above, we’d taken a different approach. Then, we could consider what behaviour we want to encourage and for whom. For example, we want the Customer to share their e-mail address with us online. The most important thing here is not the wording. It’ that we find a way of keeping the business value in the conversation and when we’re talking about the capabilities, we focus on the user. What I’ve described is just one way of achieving that. Themes have been suggested by many as a way of grouping user stories. In this case, the ‘In order to…’ can be thought of as a theme for the stories – i.e. the theme is described in terms of business value. Stories, described in terms of the user capability and incentive/context, are injected into the “theme” as we identify roles and capabilities that deliver the business value. Notice, that I thought about the “As a…” and “So that…” aspects of the user story first and then summarised the capability, yet the order in which I expressed them remained as normal. As Rachel Davies once highlighted to me, just because we think of these things in one order, that may not be the best order for a discussion with the people who will implement it. Another way of putting this is that the “As a… I want… So that…” is optimised for the conversation that helps the product owner(s) communicate what is required to the rest of the team, not for the order in which we generally discover the information. As you can see, Feature Injection doesn’t encourage you to simply move the “So that” to the beginning and reword it with “In order to”. I can see why people do that. One possible reason is because the stakeholder intent has been mashed into a user story, but that loses the purpose of a user story. I can also see why that happens, because there wasn’t an obvious place to think or talk about stakeholder intent. Business-value focused themes give us that. I hope this helps clarify a little about Feature Injection and how it relates to user stories… but remember, this is only the tip of the Feature Injection iceberg. Actually it’s just one of the outcomes of Feature Injection. Watch this space for more.